I am new to this board but I was really hoping you guys could help me out. I will be in the Syracuse area this coming weekend and was wondering about the steam locomotive at Jamesville quarry. I have never seen a picture of it, is it on private property? Is it possible to see it? If so, how. I am really not familiar with the area so any help would be great. Also, I am not sure of the plans for the whole weekend and may be in the horseheads area, how hard is it to find the steam locomotive there? If there is a Steam Locomotive with in the Quarry its self its more than likley been scraped by now or abandoned deep in the quarry its self. There is no real acess into the quarry its self and it is keeped under close eye by security cameras at all the entry gates. The abandoned Alfa Cement Plant in Jamesville its self has some old rolling stock and a few possable locomotives still siting on the lot long sents abandoned by Conrail still in there old Erie-Lackawanna colors last knowen there was an old EMD F Unit there mostley a frame with a cab the of the unit was gutted out. But access into the plant is blocked by a gate as well. Last I saw listed, the locomotive is on "display," whatever that means. Whether it's on display in a public area or not, I don't know. If it's the locomotive that I think it is, it's right outside the quarry office. I had the opportunity to be in the quarry a couple times about 10 years ago, and they had an outside display of historical equipment that had been used in the quarry. There is no way to see it from the nearest public road (Jamesville Rd. ), as it is on a private road that serves the blacktop plants and the quarry. Best bet would be to look up the main office number for Hanson Aggregates, and ask permission to visit the historical display. No guarantee that they will say OK, but I wouldn't venture onto the property unless you belong there. They should be able to give you some directions from the entrance -- the quarry entrance is south of the I-481 interchange on Jamesville Rd. Good luck. yes the last i knew the engine is still there on display along with a old steam shovel and a stone dump car,all near the main office. The steam engine is pretty deep in the complex. I doubt they would let anyone in that far. If you want to see a Jamesville engine without trespassing, go to the Central Square O&W station Museum. in Central Square, NY. #53 is there. SRS125 wrote: The abandoned Alfa Cement Plant in Jamesville its self has some old rolling stock and a few possable locomotives still siting on the lot long sents abandoned by Conrail still in there old Erie-Lackawanna colors last knowen there was an old EMD F Unit there mostley a frame with a cab the of the unit was gutted out. But access into the plant is blocked by a gate as well. Seems to still be there. Looks to be a couple of smaller engines, a hopper car, a few coaches. 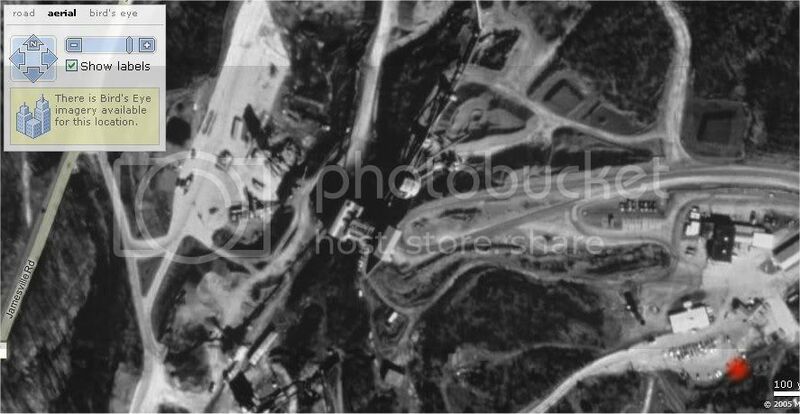 And, judging from the aerial photos, the engines are still running. At least, they've moved between the Google and Bing aerial photographs were taken. Isn't the engine in Central Square the one that was on Gulf road near Mumford? The small narrow gauge 0-4-0T in Central Square is the one from General Crushed Stone in LeRoy. When lettering was visible in LeRoy, it had the number 3 in a circle under the cab window. I don't know if the Museum in Central Square has an engine from Jamesville. If I recall correctly, Rail City had some and they were 0-6-0T's and standard guage. They must not have been in very good shape when the Rail City equipment was finally disposed of and I don't know what happened to them . The ones I took photos of many years ago at Rail City were numbered 45-57-63-77 and there was a 51 with no tank and the middle driver removed. I'd be curious to know how a stripped out F unit wound up in the quarrry. and no 53 std gauge built by Alco. the 53 worked at the quarry and later at rail city. more info at the cny-nrhs web page. it back to Indiana and spent a number of years restoring it to operation. Google Flagg Coal #75 for further info. The little steamer in the pic is still on display at the quarry up by the main office I was there for a tour last summer. Its a little over grown but you can still see it up close there is an opening in the fence so you go up and get a better look at it. And the stuff in the Alpha Cement siding is the CNY NRHS's remaining junk, which at the time of the above post probably still included the FP7 that came from Steamtown in a Lackawanna paint scheme. Some of it was Conrail at one point but none of it was ever technically abandoned there. Well, at least not so far. 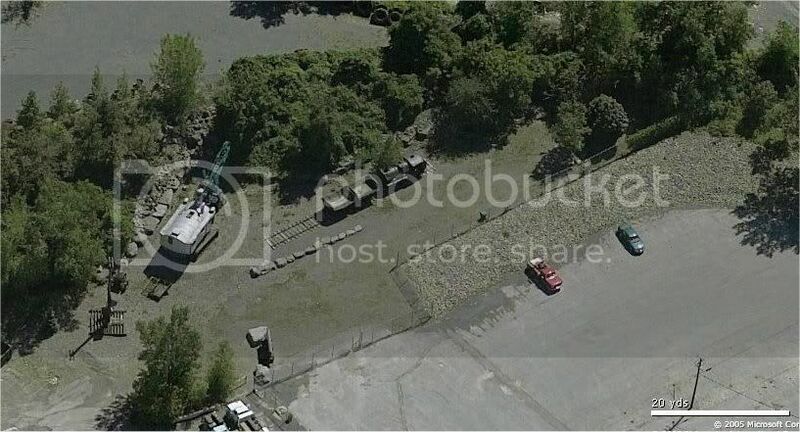 One of the Jamesville Quarry 80-ton GE centercabs is there. All vandalized to hell, even though it was operable when it came in. lvrr325 wrote: And the stuff in the Alpha Cement siding is the CNY NRHS's remaining junk, which at the time of the above post probably still included the FP7 that came from Steamtown in a Lackawanna paint scheme. Some of it was Conrail at one point but none of it was ever technically abandoned there. Well, at least not so far. One of the Jamesville Quarry 80-ton GE centercabs is there. All vandalized to hell, even though it was operable when it came in. All vandalized to hell is a bit of an over statement. I was in there last month with the owner and while some "tagging" has been done , he has it pretty secured. I'm told it does run but needs to move out to Martisco. The Jameville property is anything but secure.